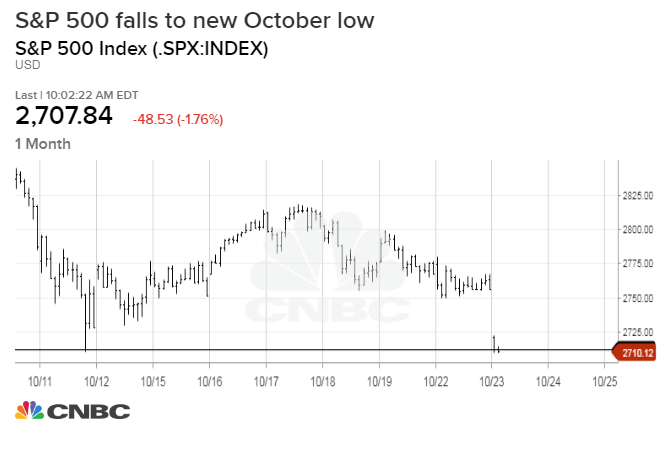 The S&P 500 fell below 2,710, its recent October low, but traded above it most of Tuesday's session. The level was a major test zone as the market looks for a bottom, but traders aren't ready to call the all clear yet. It was positive that the market bounced after falling below that level, all the way to 2,691, as a close below 2,710 would have been bearish. However, if the market stays weak and goes lower, the 2,691 will now be the low it will have to retest. 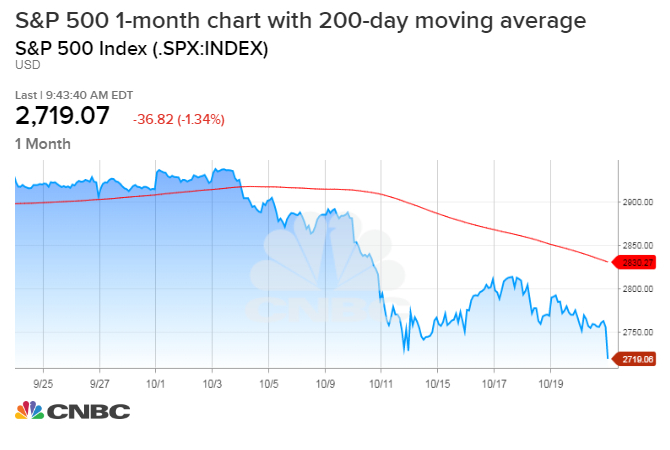 The stock market sell-off sent the S&P 500 below a key level Tuesday, and how it trades in the next few days could determine whether the market is close to finding a bottom or more selling is ahead. The S&P 500 dropped as low as 2,691, below the 2,710 Oct. 11 low, but bounced off that level and traded above 2,710 most of the day. The S&P closed at 2,740, off 15 points. Scott Redler, partner with T3live.com, said it would be bullish if the S&P tested the 2,710 level and then closed above it, which it did. The market also shook off major losses in all the indexes, with the Dow closing down about 125 points, after falling more than 500 points. "I don't think today's action gives the 'all clear signal.' But for today, it was a step in the right direction and a good trade for those who bought the dip," he said. "The confirmation will be if today's potential double bottom holds." Redler said it will be important to see how the market reacts after earnings reports from market leaders, Amazon, Microsoft and Alphabet, later in the week. It will also be important for the S&P 500 to move higher once it hits its 200-day moving average at 2,765, and not get stopped by resistance there. Others were also not ready to declare the retest a success. "It's all about China overnight. That's where it started," said Art Cashin, director of floor operations at UBS. "That's why they're not taking them to positive territory yet. China was the whole issue. When [stocks] broke through levels, there was no trap door selling. The algorithms didn't kick in. That gave people courage to start bargain hunting. It's now [about] what happens in China." When the S&P fell to 2,710 earlier this month, it was 7.8 percent off its September all-time high. Redler said if the decline continues, the next level it would test could be 2,650, the level of its prior breakout in May. Below that is 2,550, the 2018 low.